Waikoloa Beach Villas G1. 3 bedrooms. Close to shops and restaurants! This town house unit features three bedrooms, three full bathrooms, and can accommodate up to eight guests. The interior design of this beautifully villa offers simple elegance and the comforts of home. The living room is open and inviting and features a large flat screen TV and cozy furnishings. A fully-equipped kitchen comes completely stocked with high-end appliances, dining table with seats for six, and all the cookware including a blender to make an exotic Hawaiian drink. Enjoy outdoor dining on the lanai equipped with a stainless-steel gas grill and summer kitchen. The lanai looks north to enjoy the large grassy areas and sunset glow. These are just a few of the unique touches that make this unit so appealing. There’s a king size bed in the master bedroom one queen size in a guest bedroom and another queen bed in the other guest room. The master bedroom opens onto a crisp, contemporary bathroom with a glass shower, double sinks and a luxurious bathtub. There is a Sleeper Sofa in the upstairs alcove area. The comfortable living room comes equipped with everything for a relaxing evening or a “day off” from adventuring. The Waikoloa Beach Villas is a low-density community of 120 units on approximately 20 acres. Beautiful, manicured grounds have two swimming pools, two hot tubs, one fitness room for your relaxation and enjoyment. One of the best located complexes in Waikoloa Beach Resort is the Waikoloa Beach Villas. 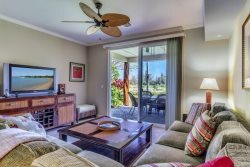 Ideally located within easy walking distances to the Queens' Mareketplace Kings’ Shops, A Bay Beach, Hilton Waikoloa and the Marriott hotels.